Though superstar Manny Pacquiao has expressed interest in having another fight, a fifth battle, with Juan Manuel Marquez, Marquez has quite unequivocally put an end to such a notion. Marquez, now aged 43 but still interested in fighting again before his retirement, told ESPN Deports how he will not fight Pac-Man again – not even for the incredible sum of $100 million! Well, now Pacquiao has confirmation that “Dinamita” will not agree to that fifth fight. Marquez sure seems to be very firm in his decision, but why? If $60 million really is on offer, why wouldn’t Marquez take a fifth fight? Is it because the Mexican great knows he got lucky in the fifth bout, landing that blockbuster of a punch just as Manny ran right into him? Then again, Pacquiao got lucky in terms of the judges deeming him the winner in the two debatable decision wins he picked up in fights two and three, and maybe Marquez is worried about the possibility of getting robbed in the Philippines in a fifth fight. 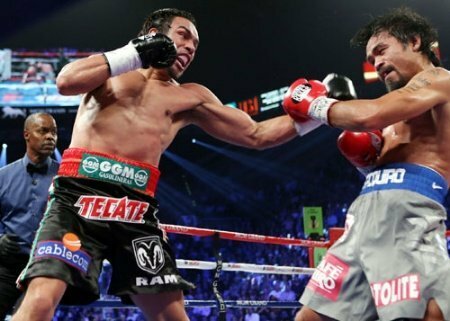 Would Marquez be able to KO Pacquiao again, or would Pac-Man turn the tables on his rival in a fifth fight? It seems Marquez will not budge and we will never get an answer. As to who Marquez may fight if he does box again before retiring (picking up a whole lot less than $60 million of course), who knows who the opponent could be. Pacquiao has still to sign for his expected April fight; possibly against Jeff Horn in Australia.